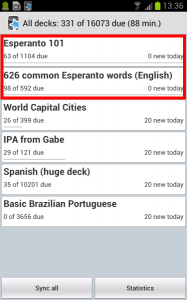 I returned to San Francisco about a week ago and started working on Esperanto again. After my intensive German course I was too busy to work on German much. My job was in English. Since I’m no longer in Austria and will probably not use German much in the future, I’ve switched back to Esperanto. 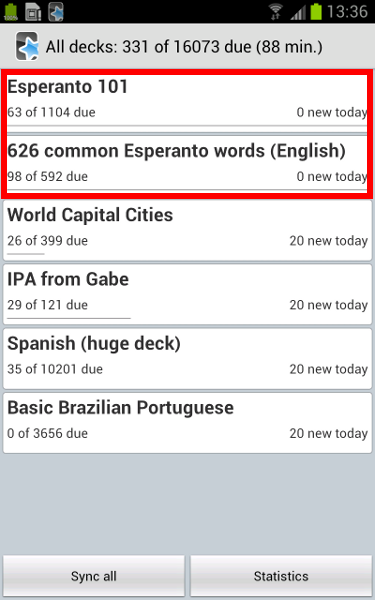 I loaded two decks of Esperanto flashcards into Anki and have been working through them. I’m using a very loose version of the memory town method. I’m not dividing the memory towns into as precise sections as before, because I find that it slows me down enough to make it less fun. I’m basically using the vocabulary technique that Harry Lorayne mentions in his books, while also adding an element of location by placing different languages in separate towns. Since Esperanto grammar is very simple, I’m only separating the mnemonic images into different parts of the town based on loose associations. “On cow”. The sound “an” is Arnold Schwarzenegger in my phonetic system. He is on a cow and holding a swan (2 = too). “On core”. An apple core is floating upright on a still puddle of water. Pressing on the back of a cow to make almonds shoot out of its mouth. Almonds = almost. Baldur with a football uniform (Sooners). Allemande is a type of dance in early European music. “Least” becomes leash — an early German dance with the dancers on leashes. Most of the other words go in the parking lot of a shopping center. One of the most helpful things that I’ve been doing is listening to Esperanto podcasts. I got a podcasting app for my phone and downloaded some episodes of Radio Verda. I play the same segments over and over, repeating the words after the speakers even if I don’t understand the meaning. After about two weeks of Anki and the podcasts, my Esperanto comprehension has increased dramatically. I’ve seen all of the 1,700 flashcards, and probably have a vocabulary of about 1,000 words, not including ones that I can figure out based on the roots, prefixes, and suffixes. An example of an Esperanto word that I don’t include in my known vocabulary, but that can be easily understood based on the rules of Esperanto, is malzorge, because if you know that zorgi means “to take care”, then malzorge probably means “carelessly”. I already had a vocabulary in Esperanto, so the 1,000 number is not the number of words that I’ve learned recently, but just a rough estimate of my current level. I’m trying to learn some Latin words. There is about 1500 new words to learn. Which method do you think is the best to learn it only in 3 weeks? I would use association to remember the words. If you have to know the grammar also, you could place the mnemonic images for the words in different locations, based on their functions. By the way, do you have flash cards or a spreadsheet of the words? books written for beginners with reduced vocabulary. Thanks… I’ll check out the links. I’m already reading La Aventuroj de Alicio en Mirlando and can understand much of it. I’d be fine with reading of that level if I just get a dictionary to fill in the missing words. I’m in El Cerrito at the moment, but I’m not sure if Esperanto-USA has a storefront or if I need to order the dictionary online. Okay, I’m gonna try to create some flashcards. I have a great list of words from various systems of human body. 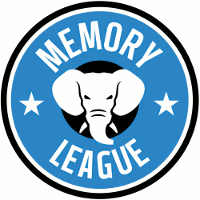 I was thinking I could create some memory palace but I don’t have enough time to do it. So I was looking for some faster methods. 510-653-telephone-0998. You can always buy by mail, but you would like to check the books before buying. You will need the phone number to get the door open. Don’t forget that you can find thousands of books and magazines on the web. Dankon… mi iros al la okazo je 8a septembro. Mi acxetos vortaron kaj libron tie. Bonvenon kaj sukceson pri via reveno. Mi revenis de Vjetnamio. Jam multaj el miaj fotoj trovigxas tie. Cxu http://www.facebook/neil.blonstein au’ simila. Aires, I intend to go there in 2014. Many countries have their National Conventions every year. will be much less than for World Conventions. the Office at 1500 Park Avenue, Suite 134, Emeryville, CA. That’s the event on the 8th I’m going to. I went to the meeting in San Francisco yesterday as well, but no one was there. I didn’t know much about Esperanto, but then discovered that the USA’s Esperanto organization was a few miles from where I was living. I started looking into the language and was fascinated by it. I work in the travel industry and became interested in the potential for Esperanto. A third reason I chose Esperanto is that it’s very easy to learn, so I thought it would be a good language for testing memory techniques. I ended up in a week-long Esperanto intensive in Slovakia, and then was hooked. I’ve met a lot of interesting Esperantists already without even being fluent yet. Hi Josh, actually, I would love to have an international language like Esperanto which is not owned by anyone. The Chinese characters are interesting because you really can put mnemonic skills to the test and great use: 3000 characters to become a decent reader. But, the complex ones contain of simpler ones, so by making up stories, creating interactive images, and doing this in a systematic way, you have good shot. Of course, you need vocabulary as well. Mi ankaux uzis memortehxniko pri lerni esperanton kaj estas mirinda sistemo. Mi tro sxatas vian sistemon.